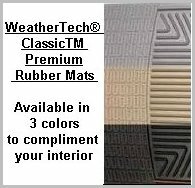 WeatherTech Rubber floor mats are the most durable available! Protect your carpeting from dirt, sand, snow, mud, leaves, grit and grime that is tracked in from the outside every time you enter or exit the vehicle. WeatherTech® floor mats, molded from pure latex, will not crack, curl, or slide around. These mats hold 1 ½ quarts of water, sand or mud in their ridges and grooves. They are still comfortable under-foot and kind to fine shoes. Use over factory plush floor mats as protection or as your regular daily mats. WeatherTech floor mats will keep your carpet clean and dry no matter what weather conditions exist. These mats conform to the shape of your vehicle and are easy to clean--just lift out and shake or scrub, and rinse away every bit of grime. The underlying carpets remain as new as the day they were made. Available for all cars, trucks, and sport utility vehicles in grey, tan or black. Please state your vehicle's make, model, and year in the customer comments box on order form. While most front rubber mat patterns are vehicle specific, rear mats are determined to be the best possible fit for the application from Weathertech's many shapes and sizes. Click on the sets below for more information concerning rear mat patterns. Floor mats can only ship by UPS Ground Service. International shipping is not available.